The days of using a drawing board are not quite behind use, and when it comes to sketching out a quick idea for a website, or even a program interface, it is quite common to reach for a pen and paper rather than a computer. But this may change if WireframeSketcher has anything to do with it. This is a design application that makes it easy to create rough mockups for websites and applications. Whether you are designing for the Internet, Windows, Mac or mobile platforms, WireframeSketcher can be used to quickly knock up an interface. 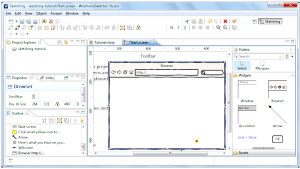 The program can be used on solo projects, but there are also tools for collaborative work. There is an extensive library of page and interface elements that can be dragged and dropped onto your workspace to create an interface design in moments. The app is something of a dream for designers. One of the problems with working with pen and paper is that it can look somewhat unprofessional when the time comes to present ideas to prospective clients, while creating fully-fledged mockups in a graphics package can be extremely time-consuming. The semi-hand-drawn look of WireframeSketcher is cute and appealing, but means that it is easier to focus on layout and basic ideas rather than the finished look of a product. Basic behaviors can be added to interfaces so it is possible to try them out rather than just look at a theoretical layout. The free download is a trial version of the program which allows for use of all features. Any files you export from the application with be watermarked and a reminder dialog will be displayed each week. You can find out more and download a free copy of the app, pay a visit to the WireframeSketcher review page.